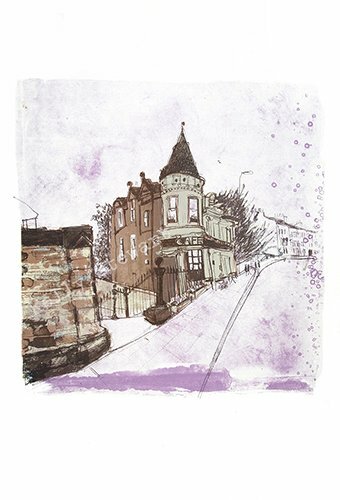 An original screenprint, depicting Montrose House, Edinburgh. An original screenprint, printed by hand by the artist at Edinburgh Printmakers Workshop. Screen printed onto 300gsm Somerset paper. It was the first week back at University, in Illustration class that my lecturer and now very good friend, Kendal Murray asked us whether anyone would like to continue with screen printing after an introduction to it in the previous semester. I raised my hand instantaneously only to realise that I was the only one. I couldn&#39;t understand why nobody else wanted to do it, I thought it was the most exciting thing ever...and 20 years on, I still do. Screen printing allows me to combine my drawings with mark making, handwritten text and found textures all in the one image unlike any other medium. There's always the surprise element when I screenprint a new layer onto the existing layers, you can never fully predict how they will print. After I left university I knew I needed to be in Europe for the architecture and culture so I bought a one way ticket to London from Australia. I arrived in Edinburgh, joined Edinburgh printmakers workshop and 17 years on, I'm still here. I have been drawing the architecture of Edinburgh as well as London, Paris, Bristol, Zurich, Lisbon to name a few. I have travelled extensively around Europe, skooting off to old towns when I can to make the most of it's close proximity, to be immersed in a different culture and be in awe of the architecture.